Being a publicist is basically marketing a talent in a way that makes it lucrative and appealing. There are many talented people in Zimbabwe but you don’t know too many of them because they don’t have a functional management team or a publicist. If more of our local celebs had publicists, we would have made strides in the industry but no people just want to manage themselves and not part with money to invest in their personal brands. I have always enjoyed advertising and public relations. Devising a strategy always gives me such a high. Personal branding is exciting for me because no two people are the same which means no two brands can ever be the same. Every strategy has to be original and that is a challenge that never bores me. 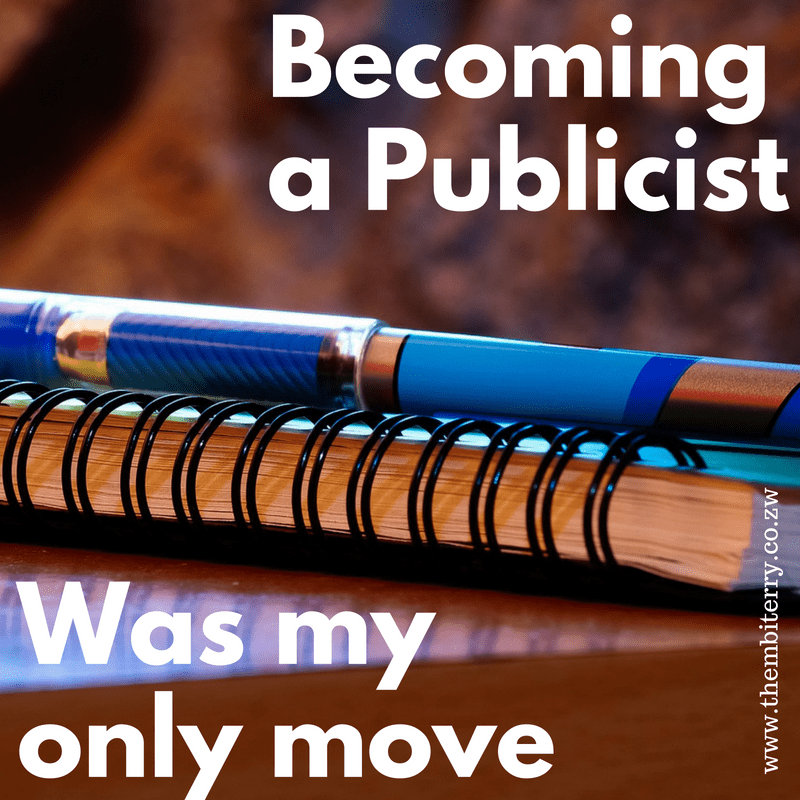 Being a publicist is what I want to do in the long run. Just the idea of it gets me going. I am a first born Leo, of course I like telling people what to do. I’m like the voice of reason or the narrator in a story. That’s too humble, I’m like the GPS voice that leads you to the land of milk and honey. Best believe I am Siri outchea putting you on the map. I take the time to assess your brand, then I devise the strategy that you need to employ from the objectives that we would have agreed on. I don’t take lightly to not being listened to. If you mess up, I’ve messed up and I will quit like Chris Brown’s publicist. Those with ears let them hear. The worst thing for me is seeing people under utilizing their talent. When you can clearly see that this person is going places but they are either too lazy or just flippant. Wasted time is a curse. You are wasting a valuable resource that you can’t ever have back. You’ll wake up years from now and be drenched in all sorts of regret. Live while you can. Exhaust all the talents that lie dormant within you. The world is waiting for your brand of special. You can’t tell from looking at my room or working space but I am very orderly. I truly respect time and deadlines. When we identify the objectives we are trying to achieve for your brand, my brain just gets going and you’re gonna need to keep up because it will all happen so fast. Every step is meticulously planned. I know when to do what to do. I am able to exploit an opportunity for all it’s worth. All you need to do is show up and follow the treasure map. A large part of being a publicist means you have to know a lot of people that can open the doors that your client need. Musicians, models and speakers are all pursuing different avenues and you need to know who is who in those respective streets. Networking is an integral part and after years of being in different industries I have come to develop the vast little black book that I have. Whatever you need, I know a guy and if I don’t know the guy, I know a guy who knows a guy. For everything else, there’s Facebook. Media coverage is one of my favourite things about being a publicist. Writing is my thing. The challenge is being able to sell one person in a million different ways. The rule of thumb is, everytime someone reads an article about my client, they need to walk away having learnt something new. Every media publication is different. I need to be able to adapt my client for Cosmopolitan today and Time Magazine tomorrow. Those are two different angles altogether. My job is to keep my client in the papers and on everyone’s lips.